You’ve just enjoyed a delicious lunch with the wife and kids at the Broadway Plaza shopping center. Now you are on your way back to San Francisco on SR-24. It’s raining pretty hard. Rain can often be a perilous natural element when you’re driving along any highway. You need to be more aware, maintain a safe distance from the car in front of you, and drive at a slower speed. There are many dangers that are just unavoidable however. Imagine you are driving on this slick highway and a small animal jumps out in front of your car. You break too hard and veer off the side of the road plunging into a ditch. Your car is sinking in the mud. This sounds like an impossible situation, but it is nothing new to Shield Towing. We can recover your vehicle in no time flat. We use a cutting edge winch system to extract your vehicle right out of that ditch. We can recover any vehicle with our winch system. We perform our services with the cooperation of an independently owned and licensed tow truck operators. Our skilled technicians will provide you with exceptional recovery service and rescue you in your time of need ensuring your safety and the safety of your vehicle. We work hard 24/7 to meet the needs of our customers and we always have a fleet of trucks on hand. We provide quality service. You can always rely on a reputable company like Shield Towing. We are proud to boast Fast Time of Arrival – we guarantee that you be serviced in a timely manner. Our prices are competitive in the industry. You’ll always know that you are paying a fair price for our towing services. 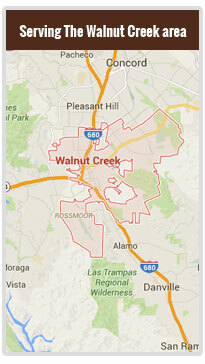 Shield Towing has served the Walnut Creek community for many years.